Cover image from publisher’s website. 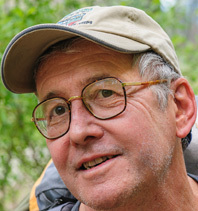 David Roberts, a long-time mountaineer and adventurer, has, over the past two decades, turned his attention to writing about his exploration of the Desert Southwest. 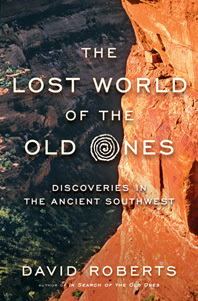 The Lost World is a follow-up to his 1996 book In Search of the Old Ones that update readers about new discoveries and theories. Roberts’ passion and curiosity have led him to explore lands once occupied by Ancestral Puebloans (aka Anasazi), Mollogon, and Fremont cultures, as well as the more-recent Navajo and Comanche. The author’s writing style is likely to engage professionals and lay audience alike. His material benefits from the inclusion of suspense and the thrill of discovery that are foreign to scientific monographs. Roberts’ discussion of issues associated with cultural resource management—how providing any semblance of a description about a site’s location can lead to its looting or degradation; the crazy-quilt of laws regulating the ownership of artifacts found on private vs. government land; and the proliferation of artifacts possibly obtained illegally and sold online—is excellent. Tragically, he recounts how even his intentionally vague descriptions of sites he explored for his book In Search of the Old Ones were scrutinized and deciphered, becoming detailed directions now posted on the Internet. The author discusses contemporary archeological and anthropological investigations that include potsherd motif and technique analysis; dating of stone, wood, dried seeds, and other materials; and ever-evolving perspectives on the abandonment and subsequent migration from population centers in the Four Corners area starting around 1125 A.D. One of the most-compelling aspects of the author’s investigations is his mountaineering skills, which, in some cases, enabled him and his companions to be the first people to access sites since they were abandoned several hundred years ago. The Fremont culture was among those that incorporated fallen or felled trees into ladders to reach otherwise inaccessible cliff sites. Where those ladders have rotted, the climbing skills needed to make these kinds of discoveries underscore the interdisciplinary aspect to the study of ancient cultures: a thorough picture of their lives can only be drawn with the help of colleagues that include botanists, zoologists, and climatologists. Roberts repeats the common claim by field professionals that “archeology is not about things”—rather, an artifact’s value lies in the light it sheds on the culture that produced it. However, as an accomplished storyteller, he makes sure to include a detailed, lost-and-found chronology of artifacts that include the astounding 1896 discovery in Utah of the mint-condition “Telluride blanket” (later radiocarbon dated to have been woven sometime between 1040 and 1272 A.D.) and a collection of eleven unfired clay figurines of people discovered by Clarence Pilling near Range Creek, Utah, in 1950. Early “archeological efforts” by laypersons suffered from a lack of record-keeping and systematic investigation. Much of what can be learned from an artifact lies in its provenience—the exact location and depth of its unearthing and its relationship to other man-made features and artifacts. Roberts recounts that by the 1990s, no living person knew where on the sprawling Turner Ranch the Telluride blanket had been found. With the help of an 1896 newspaper article and a photograph depicting the cliff alcove that had been passed along to subsequent buyers of the blanket, a team of dedicated people completed a “reverse archeology” coup by relocating the site in 2004, 108 years after the blanket’s initial discovery. Roberts discusses The Chaco Meridian, a controversial book written by archeologist Steve Lekson in 1999. Lekson contends that three important sites—Chaco Canyon and Aztec, both in New Mexico, and Paquime´ in northern Mexico—were situated at 107° 57’ longitude for a specific yet unknown reason, and that those who abandoned Chaco around 1125 A.D. relocated to Aztec, then, almost two centuries later their descendants established Paquime´. In October 2004, Roberts hit the road with Lekson and photographer Bill Hatcher to investigate this provocative theory for himself. The author continues the book’s theme of adventures that vary in time and place by traveling to the Navajo Reservation. Here, during one hike where he’s accompanied by a Dine´ guide, Roberts hears the Native perspective on an incident nearly buried by white historians: how, in 1863, Hoskinini and his band eluded the U.S. Calvary, thereby escaping the brutal 300-mile Long Walk to eastern New Mexico during which more than 2,000 of the 9,000 captives died. Another chapter discusses the Pueblo Revolt of 1680, an episode in Native American history that deserves to be better known by all Americans. Roberts can claim his fair share of remote cliff-side discoveries. However, his writing skill underpins his two greatest contributions to archeological inquiry. First, he’s adept at conveying the genius and quirks of various scientists, including the cordial tension between colleagues who embrace competing theories. In doing so, he humanizes them while enlivening the tale of their pursuit of knowledge. Second, Roberts is skilled at interpreting and expanding upon new discoveries and theories, in the process rendering them comprehensible to the layperson. His depiction of recent laboratory findings juxtaposes well with the colorful cast of characters that accompany him on his desert treks and rock-climbing feats. Some readers may find the chapter where the author describes in detail the migration that followed the dissolution of the Ancestral Puebloan world in the thirteenth century a bit too long, but that is the nature of an ambitious, sprawling book. Not all chapters will resonate with everyone, but there is certainly something within the book’s pages that will satisfy anyone interested in ancient southwestern cultures. In his final adventure, accompanied by his wife Sharon and several close friends that include a couple’s eight-year-old daughter, Roberts returns to a site where his wife had found an overturned 1,500-year-old basket partially buried in rock and sand. His every step is filled with trepidation. “Has a looter taken the basket? If so, could my intentionally vague description of its location in In Search of the Old Ones have played a part in its discovery?” Many of those responsible for the protection of cultural resources have asked “Where is the line that separates educating people of the richness of our cultural heritage from enabling those who would loot or deface?” Roberts’ “basket quest” adventure serves as a fitting example of the challenges of safeguarding this unique heritage for future generations. Author photo and bio from publisher’s website. David Roberts is the author of, most recently The Lost World of the Old Ones, among twenty-six books about mountaineering, exploration, adventure, and Western history and anthropology. Beth McDermott Reviews COLD ANTLER FARM by Jenna Woginrich.